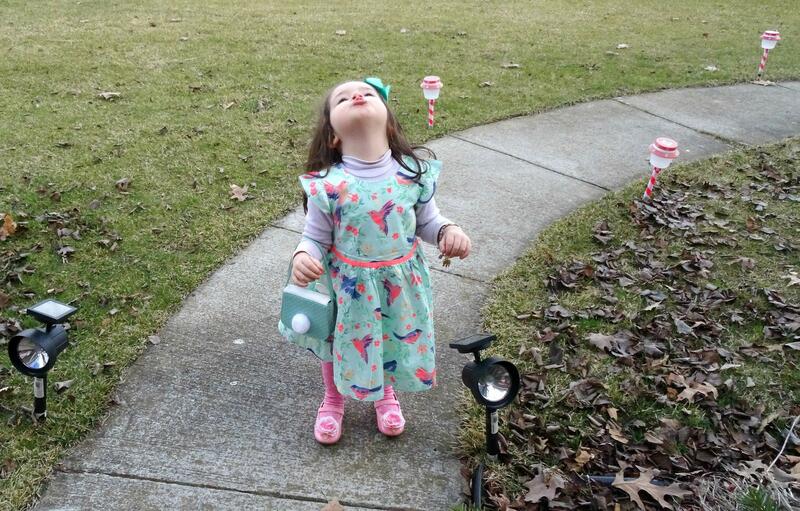 Easter Post Cards from Mommy Bloggers and their Kids. Happy First Day of Spring everyone!! 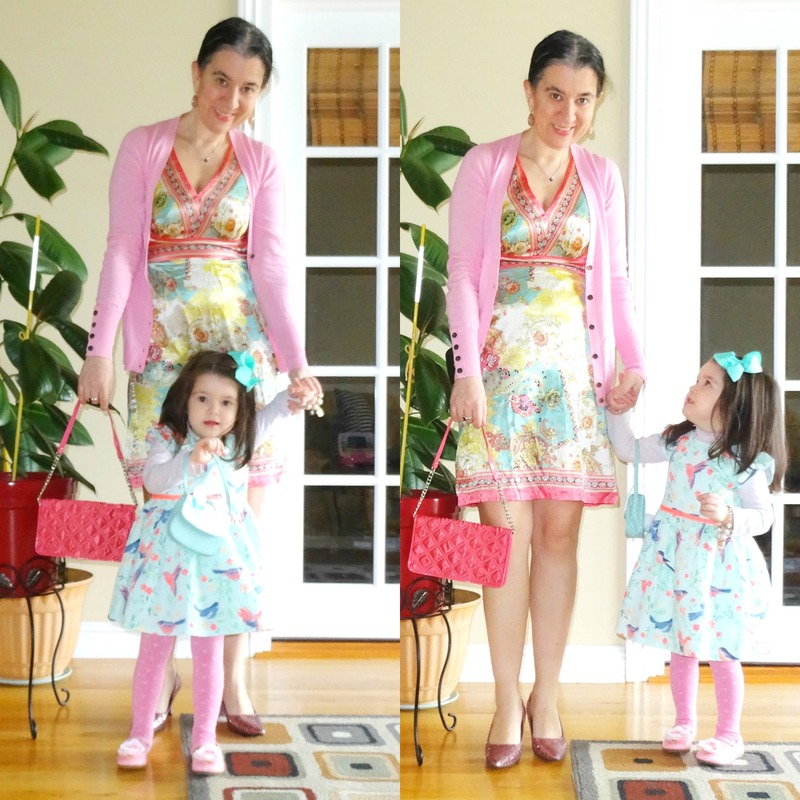 Don't Vivian and I look totally Spring-y today? That is because we have on our Easter Dresses. 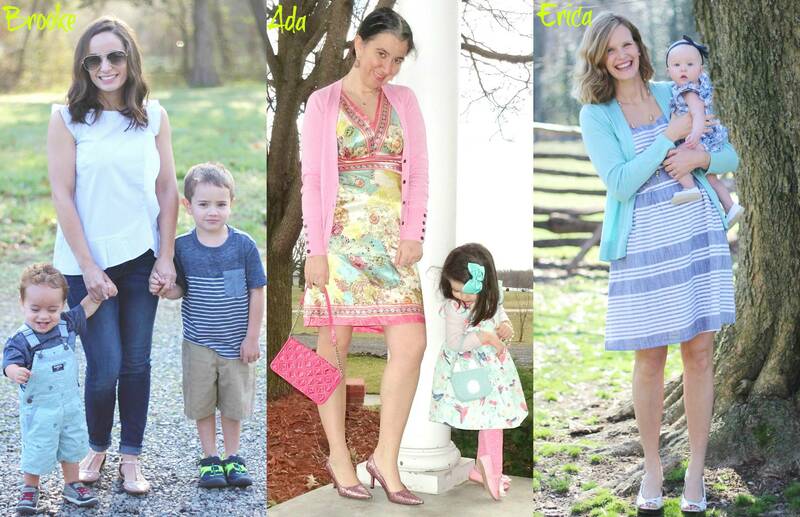 As a matter of fact, today I got together with some beautiful mammas and their babies to show you our Easter Styles. 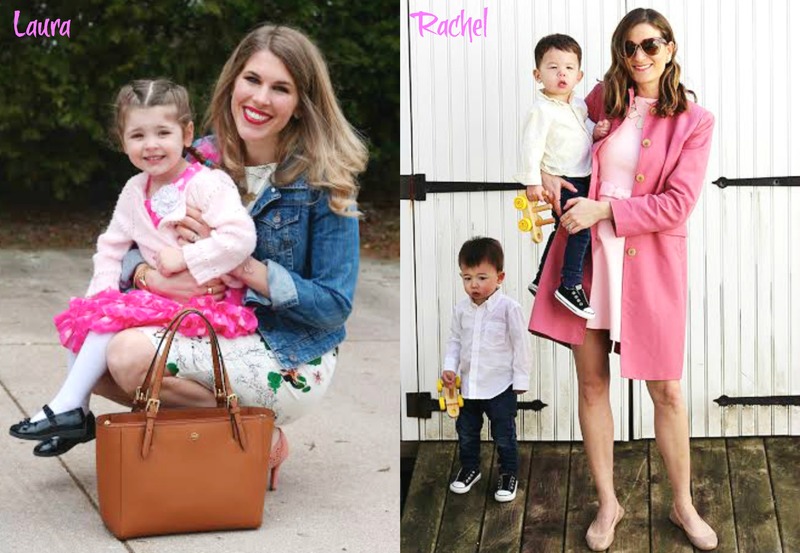 If you remember our Special Christmas Post from last December, these stylish mommies and their kids are back to show you how they dress up for Easter. Among all 7 of us we have 5 girls and 5 boys today, keeping things even (lol). I love how all of us coordinated with our babies and all of us had light colors in mind: light pink, baby blue (serenity), coral and mint. And of course some navy for good measure because navy is a great color to transition into Spring. 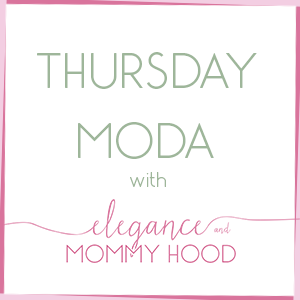 Read on below to see our takes on the outfits. BROOKE of Pumps and Pushups: "Our church is very casual, so we don’t typically get too dressed up for Easter. But we coordinated our stripes and tried to get a picture where all of us were looking! We were almost successful, oh boys! 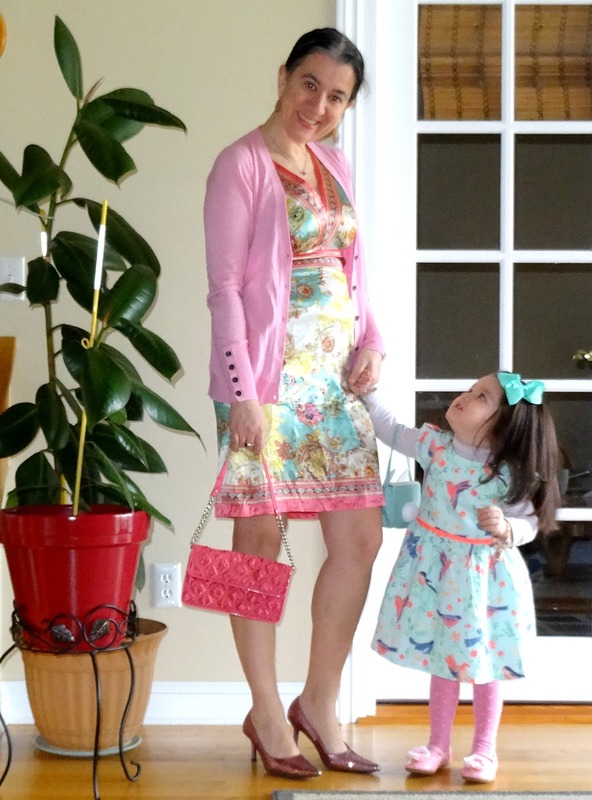 :)"
ADA of Elegance and Mommyhood: "When I think of getting dressed for Easter, two things come to mind, light pretty pastels and coordinating outfits for the family. Vivian and I did just that with our patterned dresses in mint and pink. My little ballerina loved getting all dolled up in a brand-new outfit, while I shopped my closet for mine. Thankfully, though still a little chilly, it was warm enough to take these photos. We are ready for church on Sunday morning." 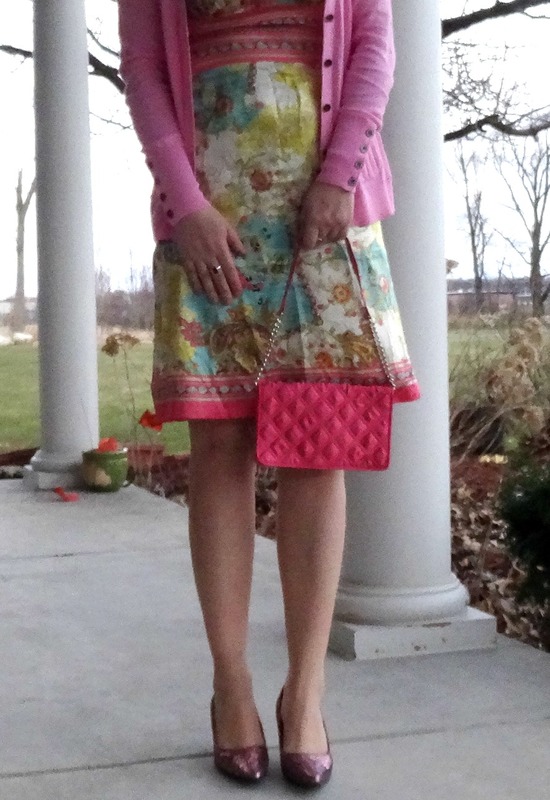 ERICA of Pumps and Pushups: "I always associate pretty, pastel colors and white with the Easter holiday. When I found this onesie for baby girl I loved it immediately for pastel blue with hints of teal, pink and yellow throughout. I chose to wear this dress and teal sweater to accent the colors in her outfit and of course had to top both of our looks off with white shoes." 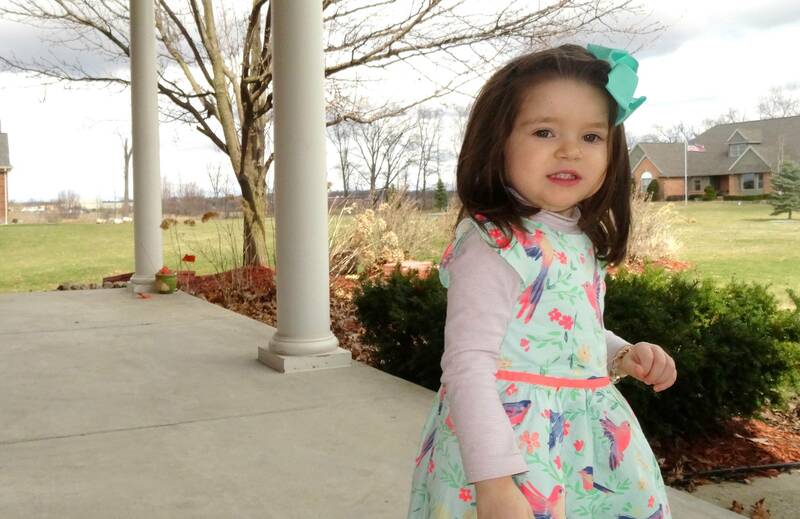 AMY of the Gifted Gabber: "I was so excited when my Mom (who is a talented seamstress) offered to alter two of my saved childhood Easter dresses for my two girls this Easter. The girls look absolutely adorable in my pale pink and mint vintage dresses. 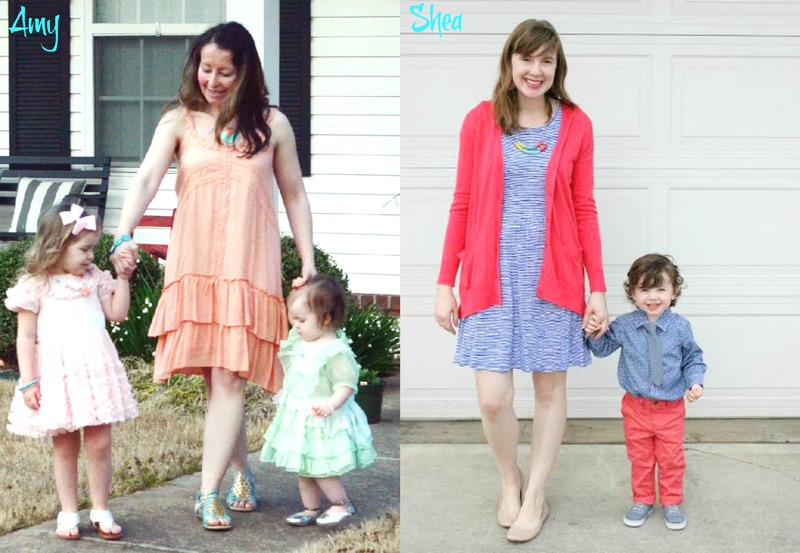 I set out on a mission to find a pastel, ruffled dress for myself to coordinate with theirs. 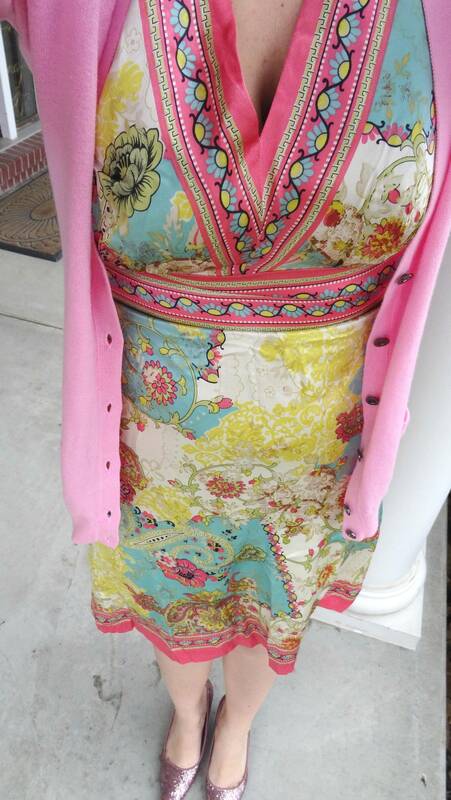 I found this peach dress at one of my favorite local boutiques." 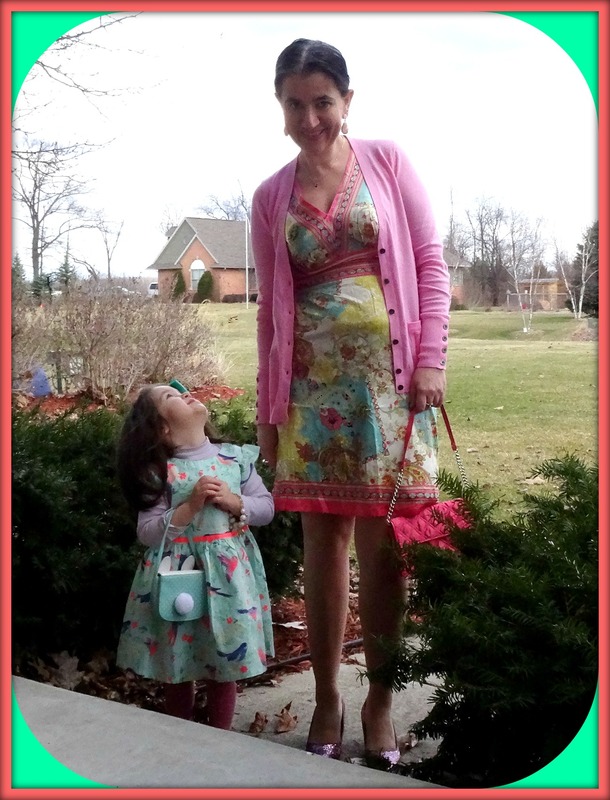 SHEA of Shea Lennon: "This Easter, my son Jona and I are wearing my favorite spring color, coral. I admit I had a little too much fun shopping for our coordinating outfits. A couple of years ago, we started the tradition of going to the 7.00am sunrise service at our church. Afterwards, we'll have to see if the Easter Bunny visited our house. (Hopefully, he comes bearing coffee.) Happy Easter!" 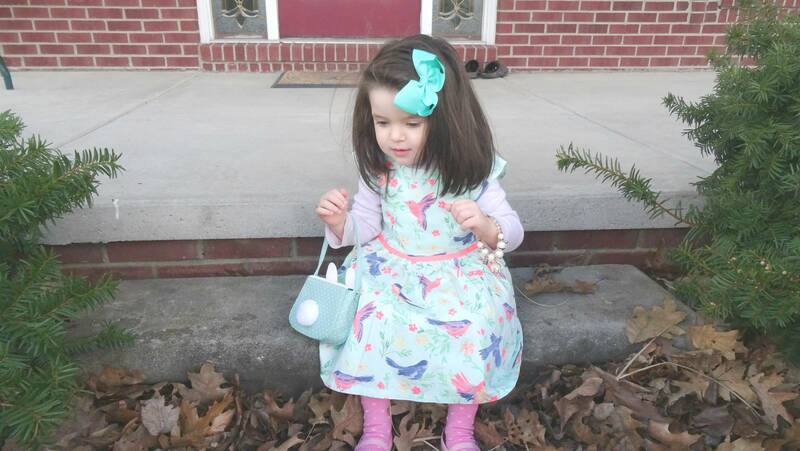 LAURA of Why I Do DeClaire: "Claire is growing into quite the fashionista. Although she claims to love 'all the colors' pink seems to be her favorite. 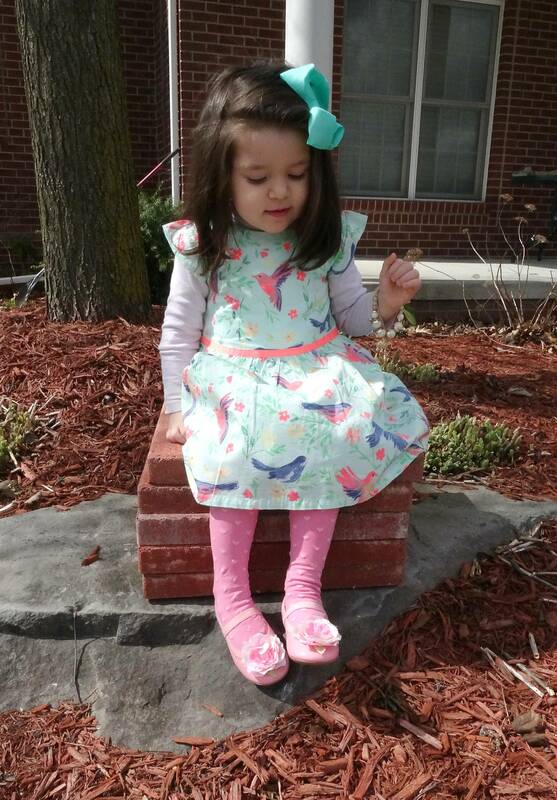 When I saw this pink on pink polka dot dress at the store, I knew she would love it. She had quite the time twirling in front of our mirror when we put her in it and was excited to take pictures with mommy! I pulled out an old floral dress I've had and added a denim jacket for an extra layer. 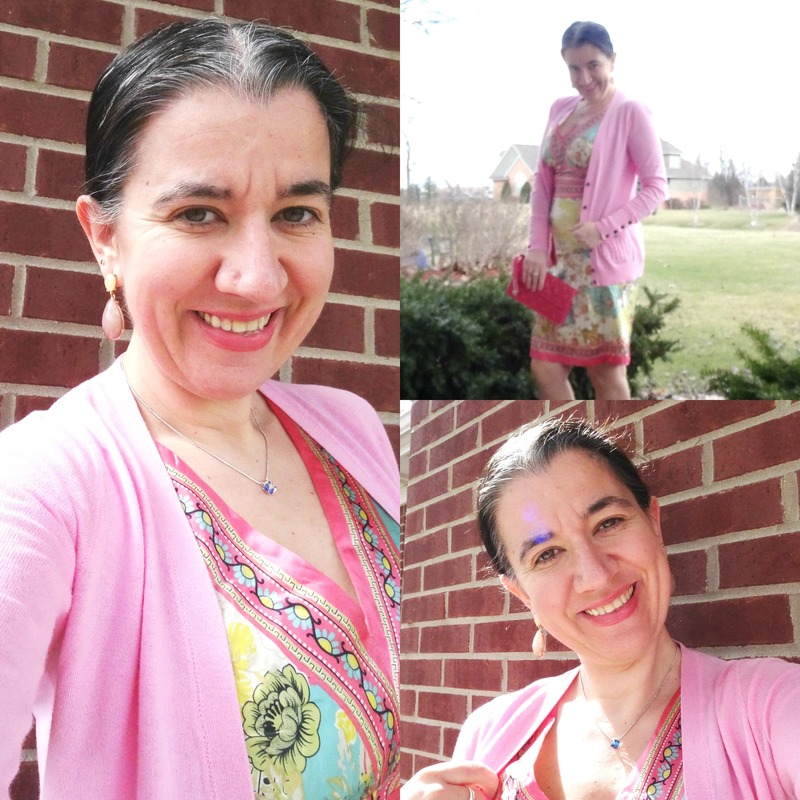 It's still chilly here, but incorporating bright colors and floral prints helps to bring the Easter feel no matter the weather!" 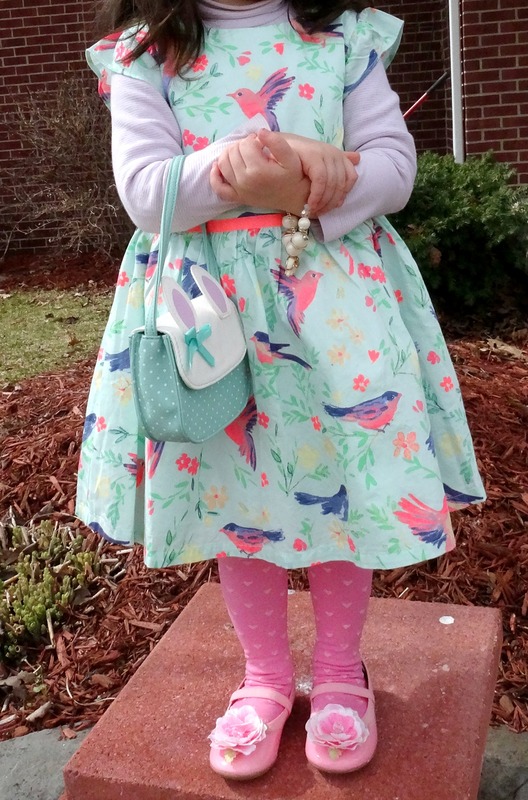 RACHEL of Threads for Thomas: "When I think of dressing for Easter, I think of girlie dresses and pastel colors. Perhaps because I remember loving the holiday as a kid, and I would always want to wear my prettiest dress for when I attended church with my great, great aunt (everyday I got to spend time with her was so special). 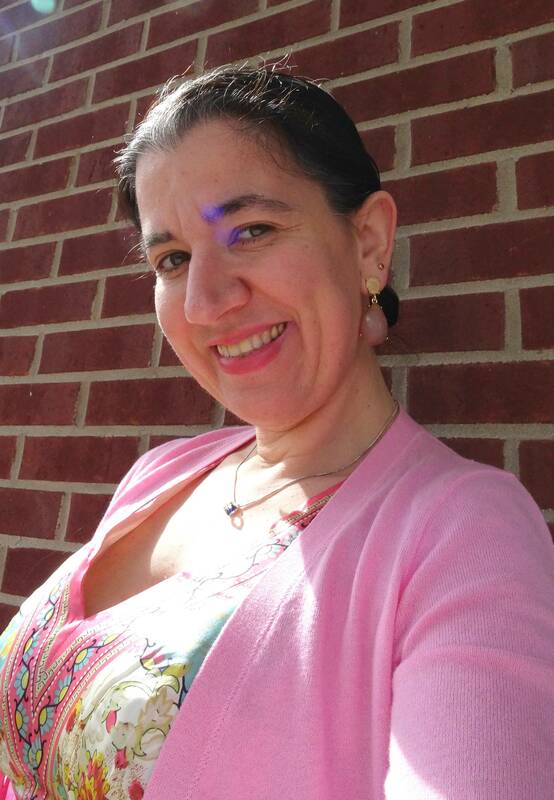 Today, I still love to dress very feminine on the holiday, and this pink bow dress fits the occasion perfectly. Since we tend to keep holidays casual in our family, I dressed the boys in pastel colored dress shirts, but finished their look with jeans and sneakers. I want them to be comfortable as I know they'll be running around all day, and can not wait to send them on their first Easter egg hunt!" 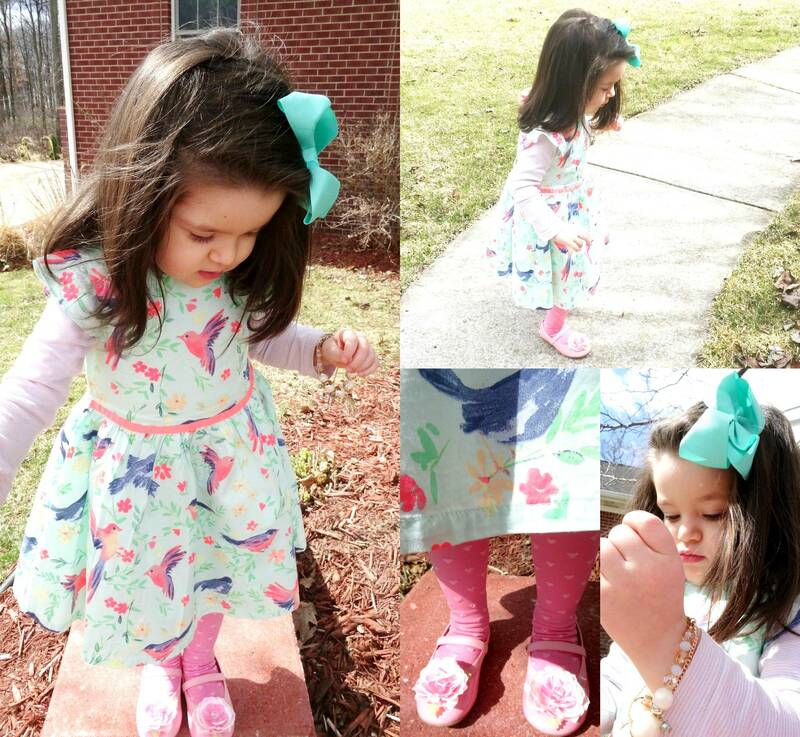 These photos featuring the outfits we plan to wear for Easter during the church service, were taken just 3 days ago. 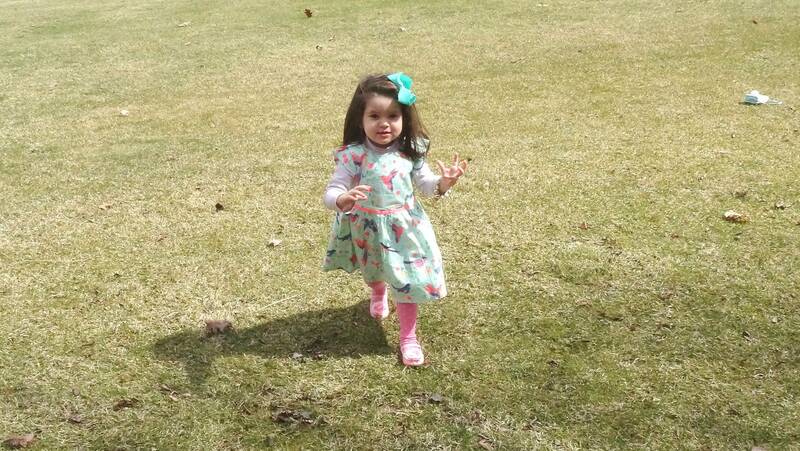 It was only about 50 degrees so I tried to rush as much as I could so Vivian wouldn't get a cold. But, just like the Christmas post we were successful in taking a million pictures. I especially took many gorgeous pictures of my little doll and I had a hard time narrowing them down to the ones for this post. 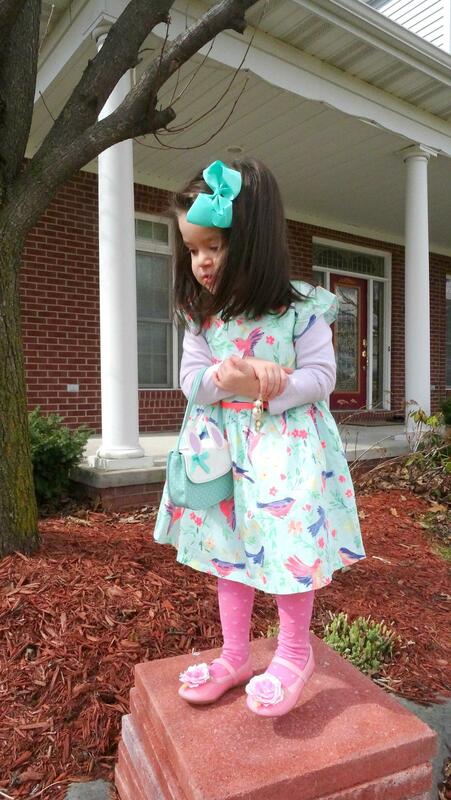 I purchased Vivian's Mint Dress at Target. It has a beautiful bird pattern on it. I even bought her a hat and hope I can put it on her for Sunday. I also got the adorable mint bunny purse at Target (look at his fun fury pom tail on the back!) and the patent leather Mary Jane ballerinas with the flowers on them are also from Target. Yep, everything is new for Vivian (the tights and bow are from Wal Mart, though). 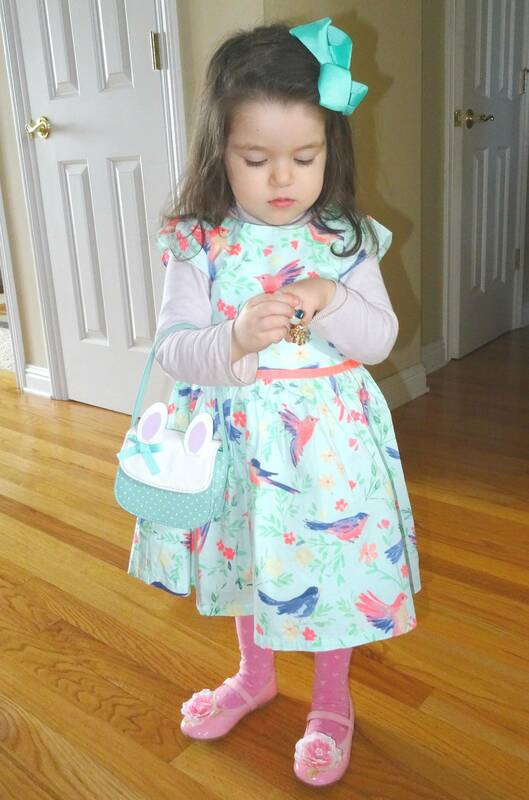 I shopped my closet for my Easter look and as soon as I purchased Vivian's Dress I knew exactly which dress to wear. 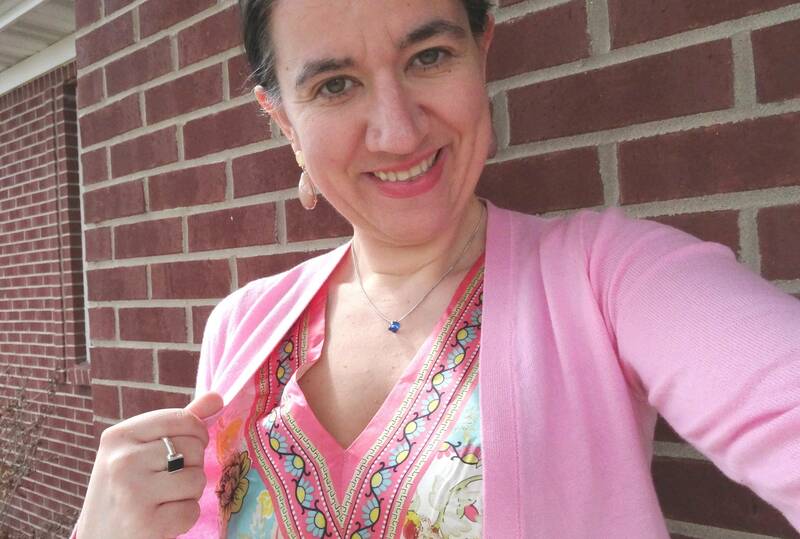 My dress from Bisou Bisou is 100% silk, in a gorgeous Ethnic Floral Pattern. 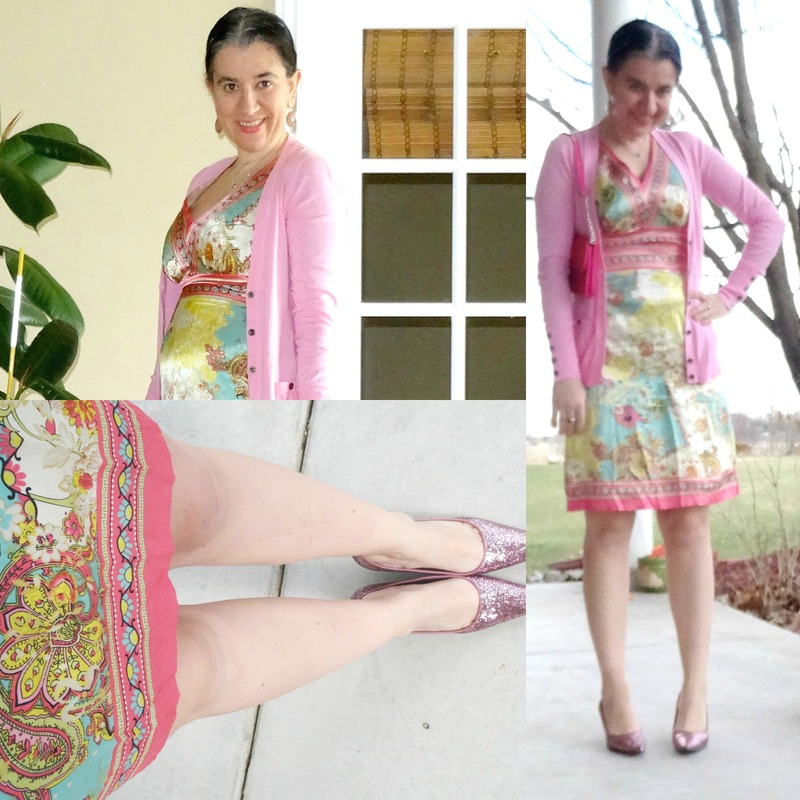 I paired it with a long Bright Pink Cardigan, my Sparkly Pink Pumps and accessorized with a very Simple Necklace and some Dangly Coral Earrings. Also my Coral Quilted Mini Bag was the perfect match. In some of the photos Vivian wanted us to switch bags lol. We will most likely wear these same outfits for Easter at church, except I might switch my jewelry a little. I asked for this pretty coral necklace for my next Rocksbox and hopefully I will receive it in my box this week (it will match the earrings perfectly). And I will put a cardigan on Vivian. I will buy her a cardi either in baby blue, baby pink, mint or ivory. 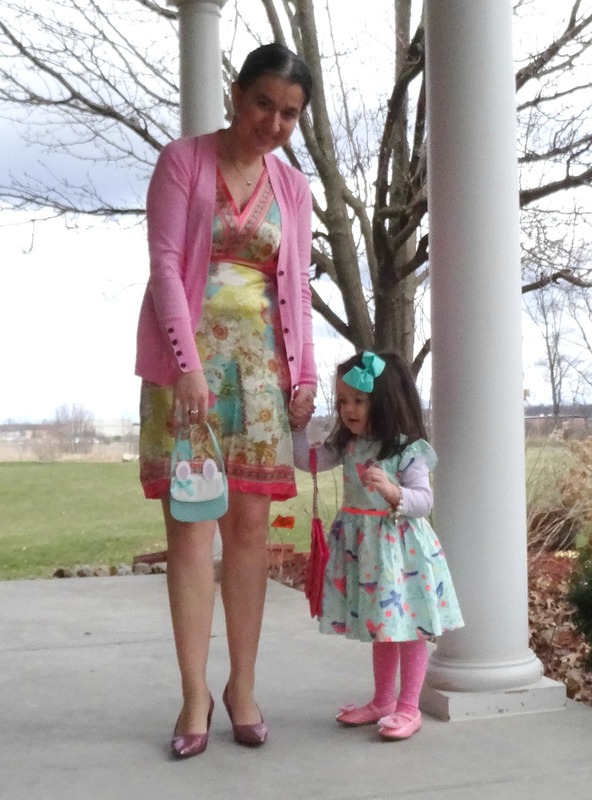 But rather than that, these outfits read Easter and say Spring head to toe. 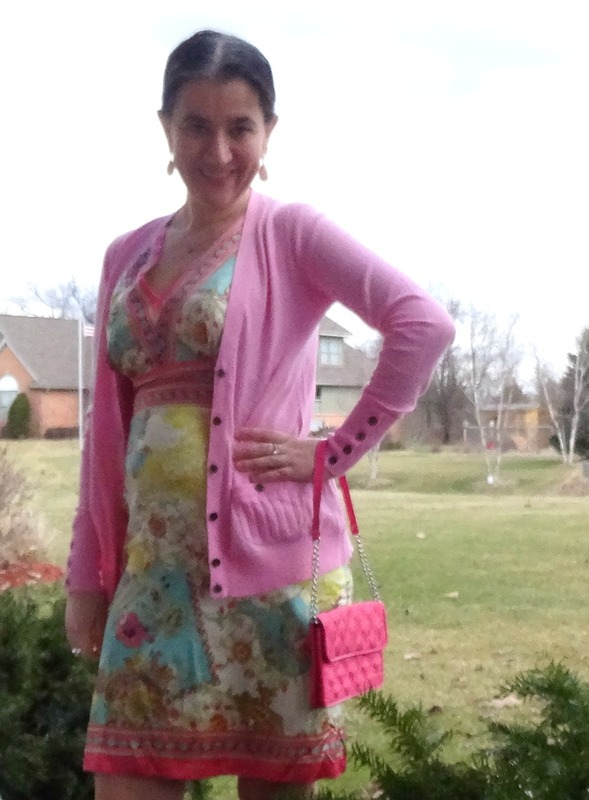 I couldn't be happier with what we wore, though my husband said we look like giant Easter eggs. 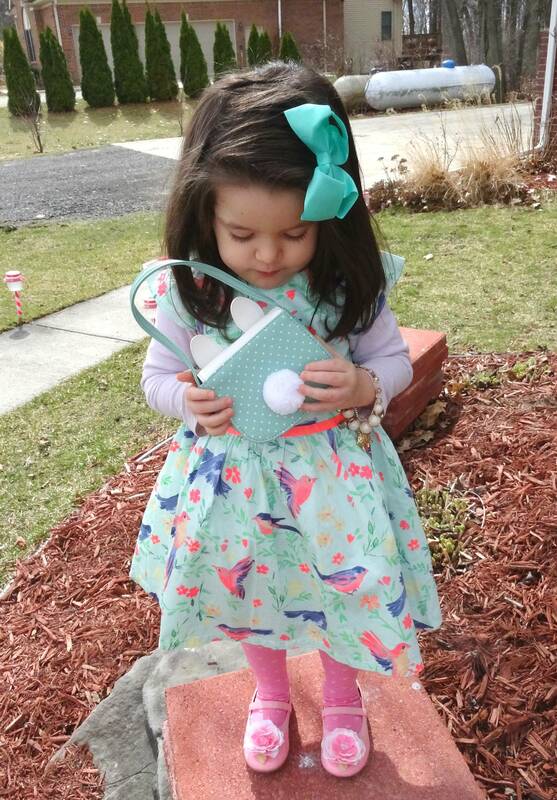 What will you be wearing for Easter and will you dress your kids to coordinate your outfits? My favorite picture of us from this shoot. Since I am wearing heels she is trying to imitate me and lifted up her leg like a little ballerina. My cutie pie. She is beyond adorable! Mint/Pink/Coral Floral Patterned, Sleeveless, V-Neck Silk Dress: Bisou Bisou (JC Penney) (similar, Splurge), (similar, Great Deal), (similar, Steal, love this). 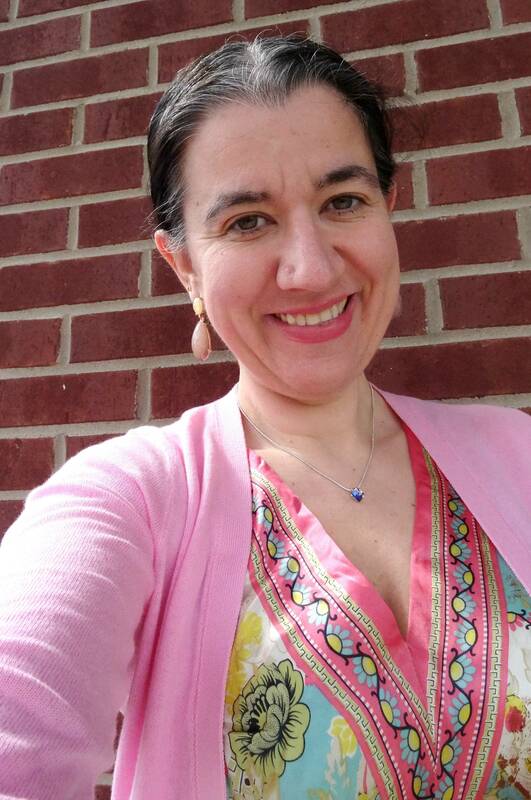 Bright Pink, Long-Sleeve, V-Neck, Long Cardigan: Martin & Osa (similar, Splurge), (similar, Great Deal, love this), (similar, Steal). Dainty Silver Chain Necklace w/ tiny Navy Iridescent Cube Crystal: Express (similar, small Splurge, love this), (similar, Steal). Pastel Coral Crystal, Tear-Drop Statement Earrings: Target (similar, Splurge), (similar, Steal, love these). Bright Coral, Quilted Silk Mini Bag w/ Mixed Media Strap: The Limited (similar, Splurge, love this), (similar, Great Deal), (similar, Steal). Blush/Rose Quartz Glittery Pointy Pumps: Payless (similar, open-toe style, Splurge, love these), (similar in silver, Great Deal), (similar w/ platform heels, Steal). Light Pink Lip Pencil: E.L.F. "Dash of Pink" Matte Lip Pencil (identical, Steal), (similar, Splurge). 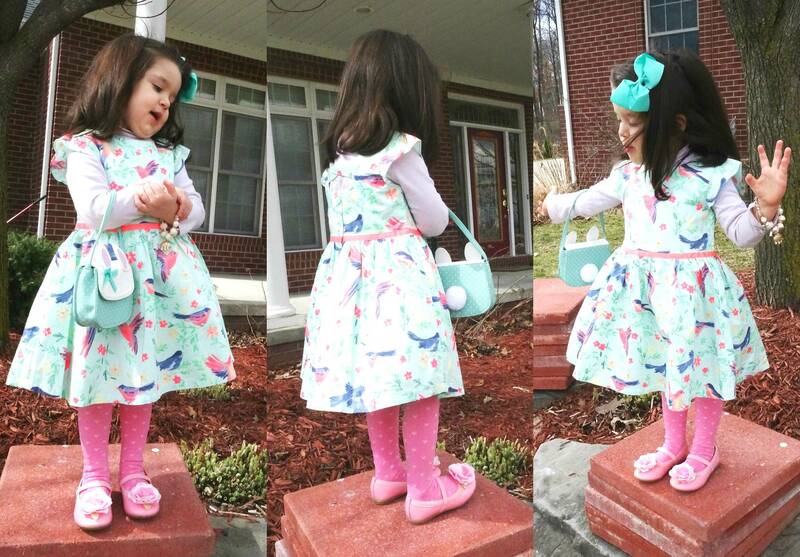 Pastel Mint Dress w/ Coral & Pink Birds: Target (New). Baby Pink+White Pinstriped Thin Layering Turtleneck: Albania. Mint+White Bunny Purse: Target (New). 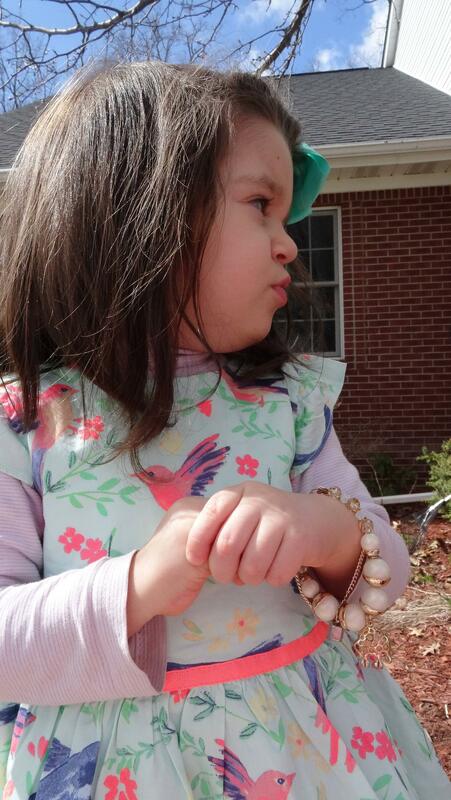 Faux Pearl Ivory Bracelet w/ Gold Elephant Charm: Mommy's (my bracelet purchased in Albania). Mint Grossgrain Ribbon Hair Bow: Wal Mart (New). Hot Pink Tights w/ Baby Pink Hearts: Wal Mart (New). Baby Pink Patent Leather Mary Jane Ballet Flats w/ Silky Roses: Target (New). Just browsing around today, I happened to find this post. 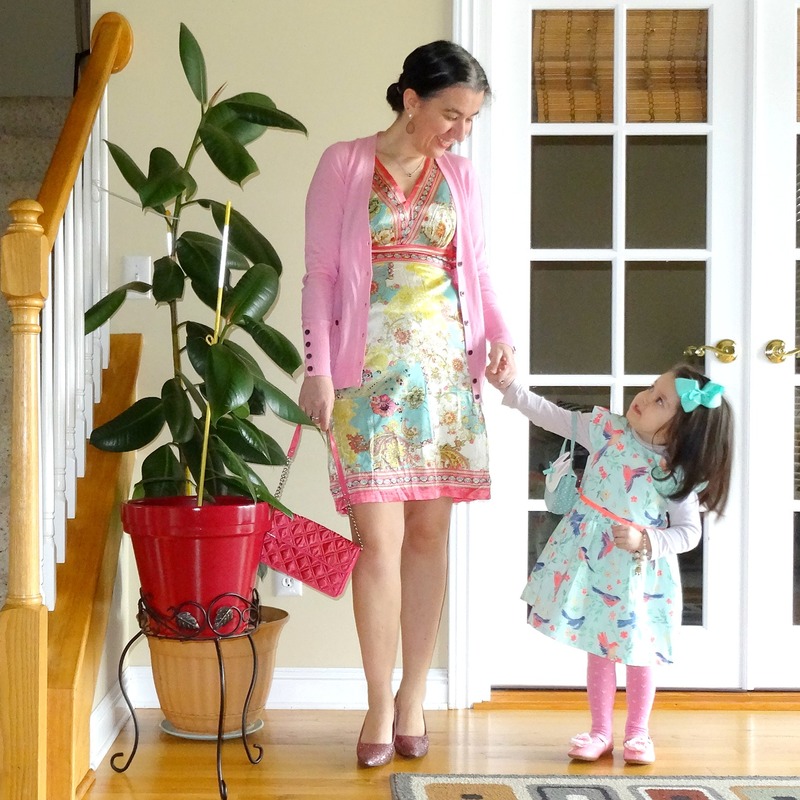 Check out 5 more Stylish Moms and their Kids dressed up for Easter, here. P.S. 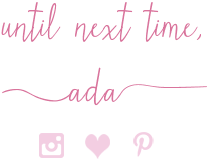 Also linking up with Ann, Amanda, Angie, Betsy + Katey, Biana, Carly, Carrie, Carrie with Whitney, Caryl, Cheryl with Kristin+Megan & Nicole, Claire, Debonita, Erin, Good Random Fun, Grace, Lauren, Leelo, Molly,Patti, Rachel, Rachelle, Sandy with Kileen, Whitney and Zaz.